Nothing is more comforting than a big bowl of noodles on a cold, wintry day. That’s actually what inspired this recipe - a ridiculously cold and snowy Chicago day! Luckily my pantry and fridge were stocked enough that I was able to pull something warm and comforting together without much effort. When I can’t leave my house, I typically become my most creative simply by circumstance. My one piece of advice for anyone who is just starting to get comfortable in the kitchen is to not be afraid to make something bad. Not everything you make is going to taste good (or look good for that matter), but the more you cook the easier it will come to you. My favorite quick meal to make is curry because it’s flavorful and relatively easy to pair with whatever you have on hand. All you need is coconut milk, curry powder (or other Indian spices), and your vegetable or meat of choice. I’ve traditionally seen rice added for a starch but this time I opted for rice noodles because it’s what I had on hand. If you’re looking for more curry focused recipe ideas that are also easy for nutritious meal prepping you can try my One Pot Red Lentil Curry. It’s simple and with only one pot to use, it makes clean up extra easy! 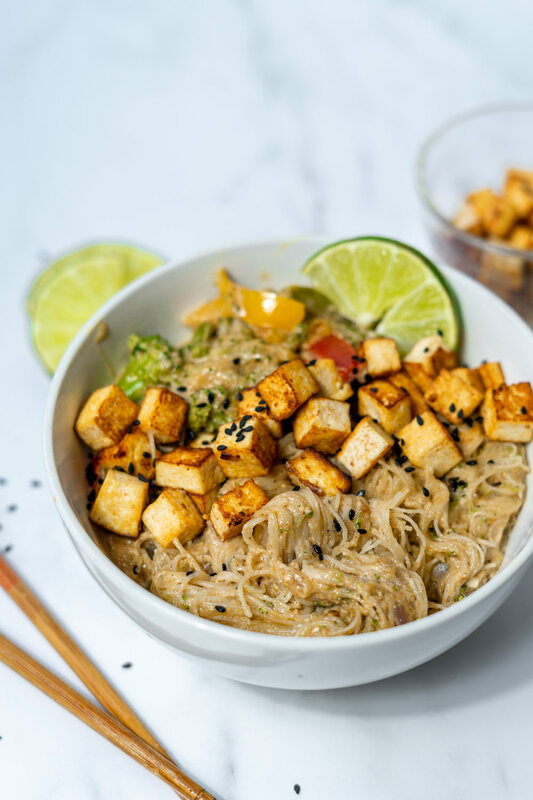 For more comfort focused meals that are still easy, I love making Sesame Peanut Noodles. Another recipe that utilizes standard ingredients you probably already have in your pantry with limited time or effort! In a medium sauce pan, heat the sesame oil, coating the edges of the pan. Once heated, add the tofu, frying on medium heat, flipping every minute. Once all sides are crispy and golden, add the garlic and salt, allowing to become fragrant and then removing from the pan to a separate bowl for later. In the same pan, heat the sesame oil for the coconut curry noodles. On a low-medium heat, add the shallot and allow to become fragrant (about 2 minutes) then add the minced garlic, also allowing it to become fragrant (about another 2 minutes). Add the can of coconut cream, frozen bell peppers and broccoli, gochujang, garam masala, ground ginger, and curry powder, gently stirring to thoroughly combine. Bring to a simmer and add the rice noodles along with the vegetable broth. Cover and stir every 1 minute. Once the noodles begin to soften, use a pair of tongs to toss the noodles so they become coated in the coconut curry sauce. 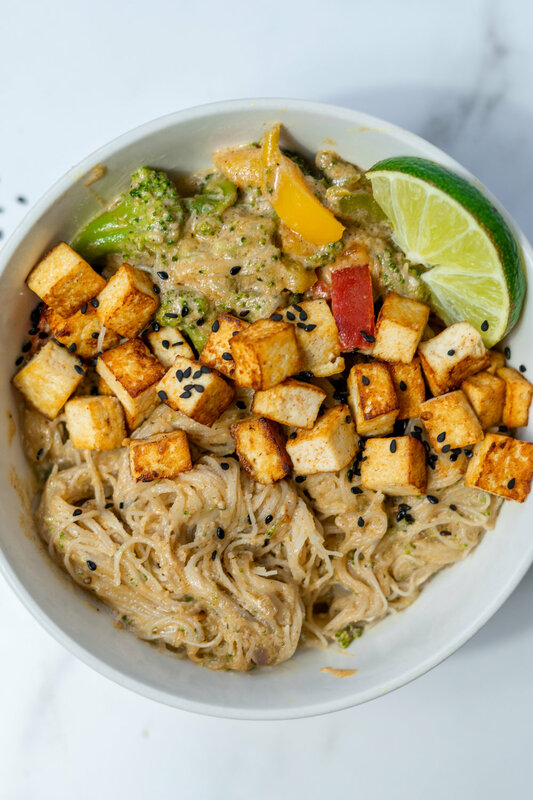 Once the noodles are completely cooked, serve in bowls with desired amount of tofu and sesame seeds (optional).